There’s no doubt technology brings convenience and peace of mind to homeowners. At the touch of a button, families can benefit from thoughtful, digital shortcuts throughout their homes. One of the newest additions to home technology is Apple HomeKit, slated for release sometime this year. Apple’s latest rollout will make controlling smart devices seamless using iPhone and Siri. Some of the first HomeKit-enabled products include Chamberlain MyQ garage door openers, Honeywell thermostats, the iDevices Switch and Schlage door locks. While you’re anxiously awaiting the arrival of HomeKit, take a look at these other advancements already available for your home. With landscaping a chore for many, and water conservation a growing concern, a robotic hose attachment may be the answer, delivering precise amounts of water to each plant. For a large yard, or to use your existing irrigation system, a smart sprinkler system may be a better answer to keep your yard looking lush. Most models can be customized by valve or zone, and many use weather data or moisture sensors to ensure the right amount of water is delivered each time. With such advancements right at your fingertips, it’s becoming easier than ever for families to manage household tasks and functions quickly and easily. Evolving technology means more sophisticated alternatives are yet to come. 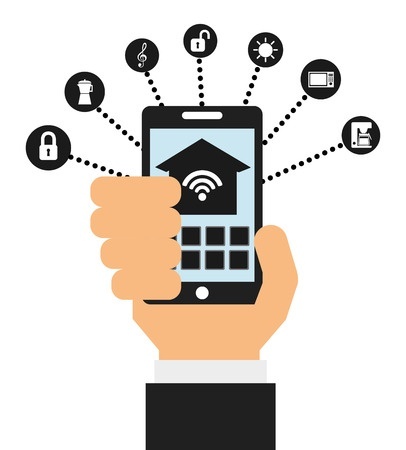 It’s clear that when it comes to home management technology, the future is only a click away.